The National Statistical Institute informs users of statistical information that the annual bilingual (Bulgarian/English) publication Main Macroeconomic Indicators 2015 is already available. The issue contains the results from official statistics' work on calculation of main macroeconomic indicators for Bulgaria in accordance with the System of National Accounts (SNA 2008) and the European System of Accounts (ESA 2010). The publication presents time series data for Bulgaria's gross domestic product (GDP) for the 2000 - 2015 period; main indicators characterizing the economy's development since 2006; main per capita aggregates for the 2011 - 2015 period. The GDP data presented by the production, income and the final expenditure approaches refer to the 2000 - 2015 period. For the main GDP aggregates by the production and by the final expenditure approaches, previous year based volume indices, previous year based deflators, ratios and relative shares are published as well. The Production and Generation of income accounts are presented by economic sector and economic activity groupings according to NACE Rev. 2. The data for employment and hours worked by economic sectors and economic activity groupings for period 2011 - 2015 are included in the publication. Revised sector accounts for 2014 are also included in the publication. The data for main aggregates of general government for 2011 - 2015, general government expenditure by function for 2014 and taxes and social contributions by subsectors of general government for 2011 - 2015 are published. The publication includes annual financial national accounts for 2011 - 2015. The publication also includes information about regional GDP and regional gross value added for the 2011 - 2015 period. The issue is available on the NSI website also. EUR 20 for a printed copy. EUR 14 for a CD_ROM. EUR 27 for a printed copy + CD-ROM. 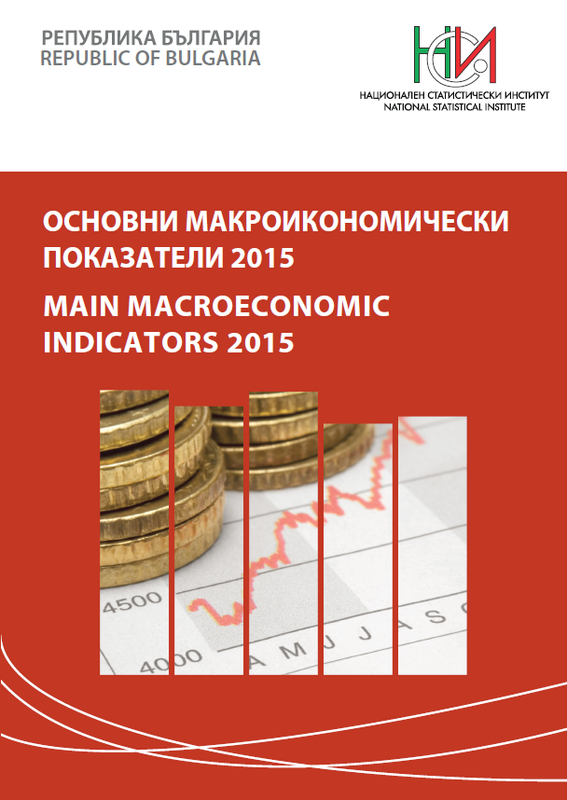 Electronic edition of the publication "Main Macroeconomic Indicators 2015"